Porter Airlines is delivering Ontario residents wanting to flee winter weather to a Florida destination that’s seen as cool, but not cold. The carrier now has winter service to Atlantic Ocean-fronting Florida’s Space Coast from Toronto, Ottawa and Windsor, with Toronto service continuing until April 7 and Ottawa and Windsor service running through March. The area is also the “surfing capital” of the east coast of the United States, she said. The gathering was also told by Jarin Eisenberg of Melbourne Main Street that the city of Melbourne prides itself on authenticity, and doesn’t have any chain restaurants and stores. Melbourne also has 10 large-scale murals with six more slated to appear in the coming months. The area’s most famous draw is the Kennedy Space Center, billed as “the place where humankind first left Earth to explore the heavens,” and which chronicles the US space program. Visitors can, among other things, stand next to the Space Shuttle Atlantis, meet former astronauts, and see actual rockets at a site where 30 to 80 rockets will be launched this year. Space Coast Florida visitors are about an hour by car from popular Orlando, with Walt Disney World being less than an hour, enabling tourists to stay in Space Coast Florida and visit Orlando’s theme parks during the day. Michael Curmi, director of Porter’s agency sales and distribution, praised Space Coast Florida’s tourism attributes. “We know that there is a significant demand from Canadians to visit Florida during the winter, and Orlando-Melbourne is a fantastic gateway for travellers to see the variety of Atlantic Ocean coastal experiences and major attractions,” he said. 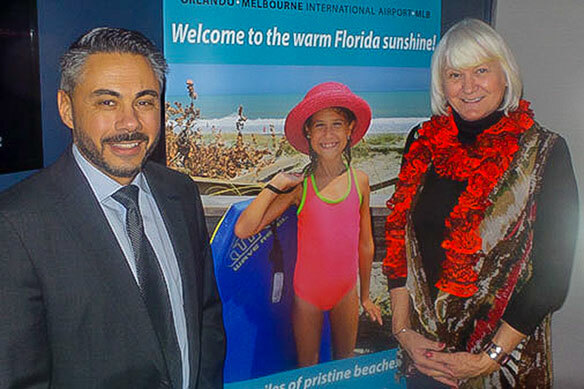 Orlando-Melbourne International Airport is making its mark in part by greeting those arriving from foreign destinations with bilingual or multilingual “international ambassadors” who immediately offer the new arrivals orange juice. Airport spokesman Rob Himler also noted that the facility has completed a US$9-million renovation. The region is also home to Port Canaveral, the world’s second-largest cruise port.